The new St Piran's Flag tourist symbol will go on show in Cornwall for the first time on Thursday. The sign will go on display on Thursday at Geevor Tin Mine. 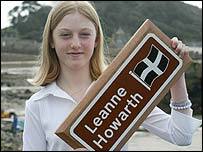 The symbol's designer - secondary school pupil Leanne Howarth from Marazion - will join representatives of the Cornwall County Council at Geevor Mine to see the new road signs in place. The flag was selected to represent Cornwall's distinctive cultural heritage following a county-wide design competition and extensive consultation. The debate was prompted after a number of the brown road signs bearing England's red rose were vandalised. Attractions can use the symbol to replace the Tudor Rose symbol or to replace the symbol denoting the type of attraction. Permission from the Department for Transport had to be sought before the symbol could be used on the county's roads. The working mine closed in 1990 and is now the largest mining history site in the UK. Erecting the first sign at Geevor was the idea of County Councillor Neil Plummer. "Geevor represents the very best of Cornish culture and heritage and using the Cornish Flag promotes a distinctive Cornish Heritage," he said.